The Good, the Bad, the High-Gloss Finish. Ladies and gentleman, here we are at last; Perfect Paint’s first blog. 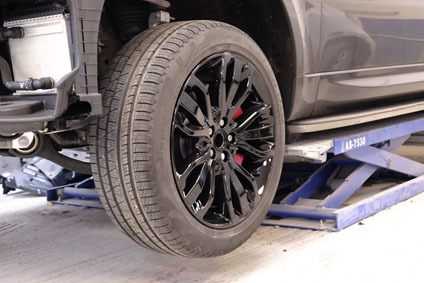 At this point we’re pretty confident you’ve arrived here with us through the usual route – a review online, a recommendation from a friend or colleague or a trip straight to our garage – and know all about what we promise and say we can do for you and for your motor. You know our track record, and you’ve come to us for all the right assurances. Here’s where we’ll be putting those assurances, and showing rather than telling. We’ll be using this blog – and all the others to come – as our proving ground. Check back with us here on a regular basis for full accounts of what we do at Perfect Paint, complete with high-quality image galleries, to ensure the best quality results for all our work, whether they be minor adjustmets, major repairs, or full-blown overhauls. If you’re curious about just what we do each day, then look no further. The Rover above came to Perfect Paint sans damage; no repair at all was required in this instance. 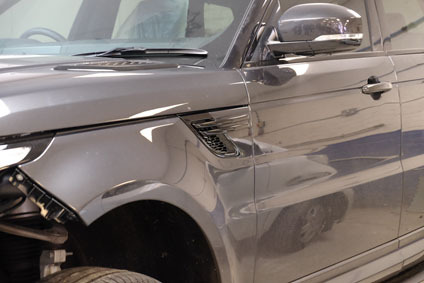 This is a buffing job, a touch-up to get a good-looking vehicle to look even better; the Sport HSE is a broad and smooth canvas of a car, with plenty of room for alteration by a discerning driver. “In this case, it all comes down to colour-coding,” says painter Stuart Dean. “The re-workings are to get everything of a piece with a specific colour plan.” The deep grey of the body will remain intact, but the extremities need close attention to get them looking top-quality. So what remains for our first case study on this blog? Be sure to follow the blog for new cars and case studies, updates on ongoing projects, and all the news from Perfect Paint!